Raymond has done another translation (4 hours of work) of a Titan Sports article that was written after the loss in Game 6 to the Jazz. In the article, we learn about the things done different this season compared to the previous 4 years under the Jeff Van Gundy regime, what his goal is for the upcoming season, and much more. Raymond has translated a Chinese article of an interview with Yao after the loss in Utah in Game 6 Friday night. 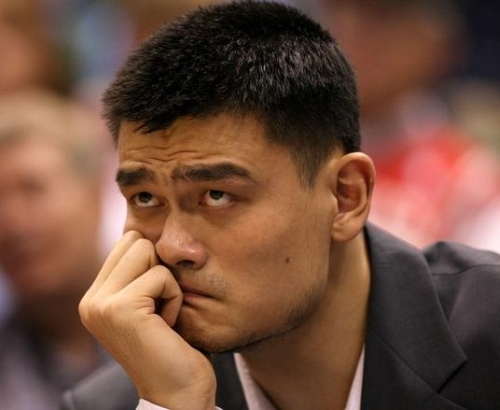 You can just feel the pain inside Yao when reading the interview. Thanks for the translation, Raymond. Did Rockets trade of Bonzi for Bobby backfire? I watched Game 1 of the New Orleans – San Antonio game earlier tonight, and former Rocket Bonzi Wells played very well (no pun intended), scoring 10 points on 5-of-9 shooting in 18 minutes and getting significant time in the always important fourth quarter. That made me start wondering if the Rockets could have used Bonzi more than Bobby Jackson. As much as I like Bobby Jack, my answer is…”absolutely.” After all, what was the main problem we heard about the Rockets during the Utah series? It was that Tracy McGrady had to take on so much of the scoring load and he didn’t have much helped. That’s because their backup shooting guard — Luther Head — played so poorly (not that big of a surprise), he probably won’t be with the team next year, and they really didn’t get much from anyone else other than Luis Scola. Jackson did have a nice Game 2 with 18 points, and Game 5 with 9 points. But that was about it. 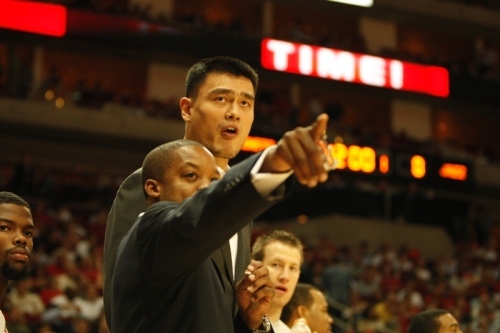 Yao has continued to stay with his teammates in Utah leading up to Game 4 on Saturday night. With the Rockets 86-82 loss to go down 3-1 in the series, it’s not over yet, but Rocket fans can’t wait until next year when they will hopefully play against Utah in the 2009 playoffs where they will have to contend against one of the best players in the league. Click here for more photos from the game. The Rockets lost Game 4 Saturday night because of stupid mistakes and terrible execution down the stretch. Bad officiating (as always) didn’t help them either. Through Houston’s 86-82 loss on Saturday night and on the brink of elimination in yet another first round playoff series, I think many things became clear about what the Rockets need to do in the off-season with their personnel. I’ll save that for the end of this post. But back to their performance in Game 4. They were stinking up the place in 3 different stretches of the game, but timely 3-pointers got them back into the game very quickly each time. However, every time they got close, they went brain dead and as a result, they didn’t deserve to win. I’m sure you all saw it, but for those of you who didn’t…the final chance they had was when the Rockets were down by 82-80 and fouled Deron Williams intentionally with 7.3 seconds remaining to put him at the line. Unbelievably, Williams missed both free throws to give the Rockets a chance to win the game, BUT 3 ROCKETS FAILED TO REBOUND THE SECOND MISSED FREE THROW, LETTING MEHMET OKUR GET THE BOARD, FOULING HIM, AND SENDING HIM TO THE LINE! Of course, Okur made sure the Jazz didn’t blow a golden opportunity like the Rockets had just done. He stepped to the line and both free throws, and now the Rockets are only 1 game away from their season ending once again in the first round of the playoffs. What an embarrassing way to lose this game. That play is going to be played on Sportscenter over and over. It’s Jeff Van Gundy‘s most hated play in basketball – failing to get the rebound after a missed free throw. If there was ever one play that showed the Rockets miss Yao Ming, this was it! But my question – as well as everyone else’s question — is this: why wasn’t Dikembe Mutombo in the game to try to grab a potential missed free throw? That’s one of several questionable personnel decisions by Rick Adelman in this game. 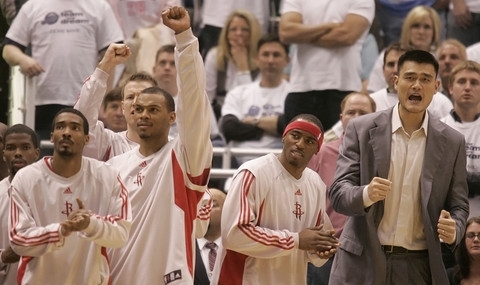 Yao and his teammates react to an important play late in Game 3 of the Rockets-Jazz playoff series, a game the Rockets won 94-92, in part because of late game heroics by rookie Carl Landry. 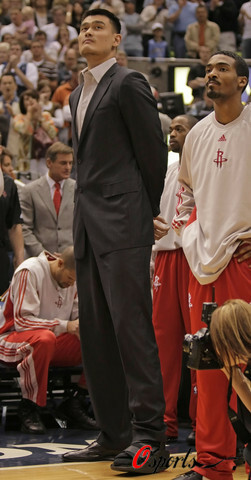 Click here for more photos from the game, which include some of Yao. Carl Landry has returned! The man who proved to be so valuable during the Rockets’ 22-game winning streak, and who we thought could be the X-factor in the playoffs, finally made the impact we thought he could in the Houston-Utah playoff series. Landry came up big with a block of a Deron Williams‘s drive into the lane and field goal attempt that could have won the game for the Jazz. Instead, it was the Rockets who won a game on a court where only 3 other teams had beaten the Jazz all season long. Landry’s block coupled with him saving the ball as it headed out of bounds with less than a second remaining in the game helped the Rockets escape the night with the 94-92 victory. If Landry hadn’t blocked Williams’ shot, then chances are that Carlos Boozer would have tipped the ball in for the win. That would have absolutely sucked since the Rockets had blown a 7-point lead in about 40 seconds leading up to that possession where Landry blocked Williams’ shot. Landry had been so effective earlier in the game hustling for rebounds and loose balls (he finished with 11 rebounds total, 7 offensive, 7 points on 3-of-4 shooting, and 2 blocks), the Rockets were loving the impact he was making on the game that had been missing during the first two games of the series. But when Carlos Boozer threw a cheap shot at him during a blockout for a rebound a few minutes before halftime, Landry was rushed to the locker room holding his face and it looked like the energizer was going to be out for the rest of the game. Just the Rockets’ luck as they were making a series of it, right? I’m surprised to see that Yao made the trip to Salt Lake City for Game 3. Of course, he won’t play, but I guess he decided to go to provide his moral support in this do-or-die game since the Rockets are down 2-0 in the series. 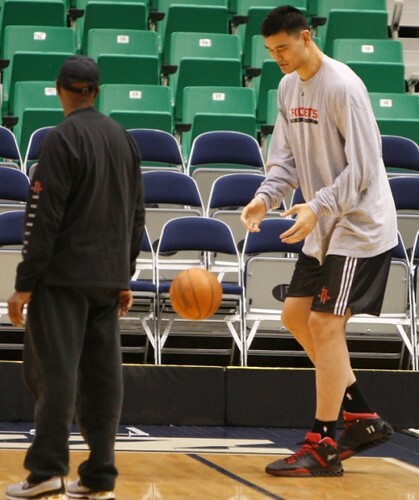 Click here to see more photos from Yao’s shootaround on Thursday morning. Thanks always to Raymond for posting the pics. As always, I’ll be providing a report after the game. You are currently browsing the archives for the 2008 NBA playoffs category.